If there is a word I use a lot, it’s dude. I know. It’s unattractive. I’m not a surfer. I’m not a guy (questionable sometimes). But I overuse the word Dude. I just can’t help it, dude. Reader Aunt Michelle told me about this new drink that she sampled at a country music concert and told me that I must write about it. 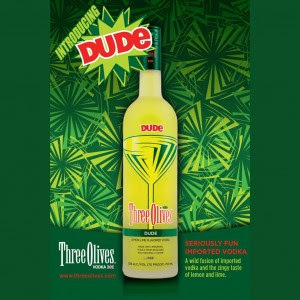 It’s called….Dude! So the Dude is a grown-up version of that concoction that you made in high school (we called it “Dewey”) that included vodka and Mr. Dew. Which if you say it kinda quick, Dude can sound like Dew-ed. Not only does Dude share a Mountain Dew taste, but it also has that electric green color. Will you try (it) Dude?